Back in my Boston days I came across these skillet sauces by Rick Bayless at the Star Market near my apartment. I don’t know what prompted me to try it out, but I instantly fell in love. The Star Market only carried two, the New Mexico Taco Skillet Sauce with roasted tomato + mild red chilies for chicken and the Key Lime Cilantro Taco Skillet Sauce with roasted tomatillo + green chile for shrimp. I tried both, and the red sauce instantly became my favorite because it tastes really great with chicken (as it was meant for). I made the Key Lime Cilantro with chicken and it was definitely good (but probably a ton better with shrimp), but the red one really became my favorite and a staple for me. I’ve never really seen these anywhere outside of that Star Market on Beacon Street. That is, UNTIL LAST WEEK. ANNOUNCEMENT: SAFEWAY IN SAN FRANCISCO NOW CARRIES THESE. I REPEAT – AS OF LAST WEEK, SAFEWAY IN SAN FRANCISCO NOW CARRIES THESE. At least, the one in Duboce Triangle. I know most of you don’t live around here, but I’d definitely recommend taking a look at your local grocery store and see if they have these because I really enjoy them! 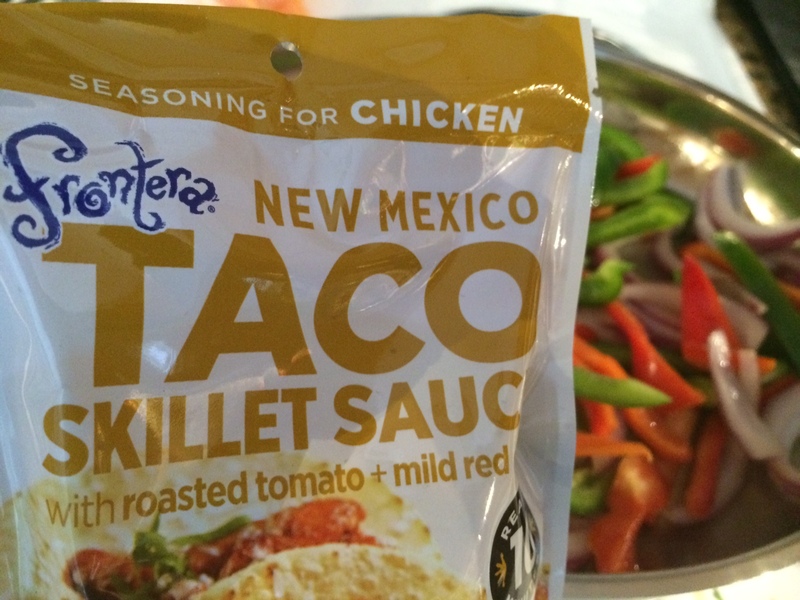 They are better than the classic dry taco seasoning and pretty low calorie (25 cal & 5 cals from fat per two tablespoons). This recipe is one I came up with in Boston using the New Mexico Taco Skillet Sauce with roasted tomato + mild red chilies. It’s a really great summer dish and goes great with lettuce cups instead of tortillas if you want to keep it super low-cal and carb free. Feel free to use tortillas instead, though! Also tastes great with some guac and salsa (particularly Newman’s Own Peach Salsa – my favorite, which, unfortunately, I have yet to find in San Francisco) and even a side of chips! 1. Cut up peppers and onions and spray cooking spray into a large skillet. 2. Cook peppers and onions until soft, but still a little crispy (approx 10-15 minutes). About half way through, add a little bit of skillet sauce to veggies (enough to coat them). 3. 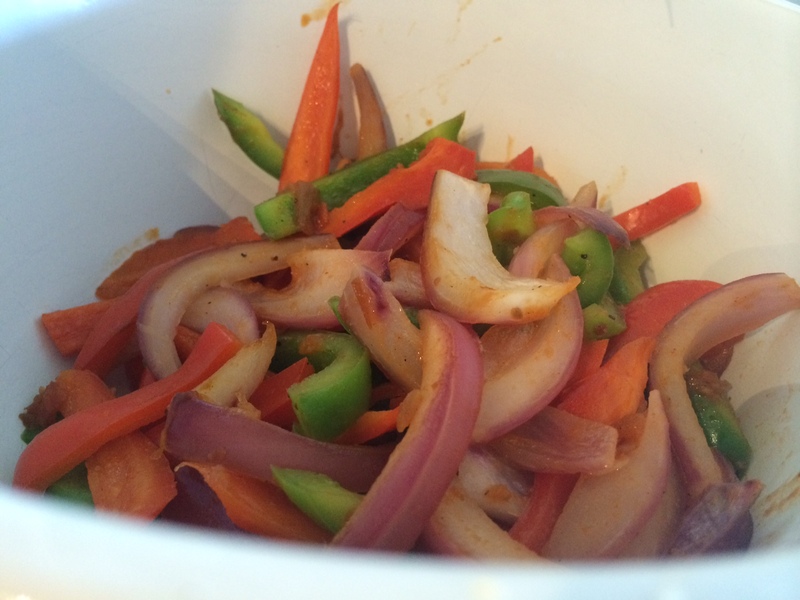 Place peppers and onions aside and spray pan with cooking spray again. 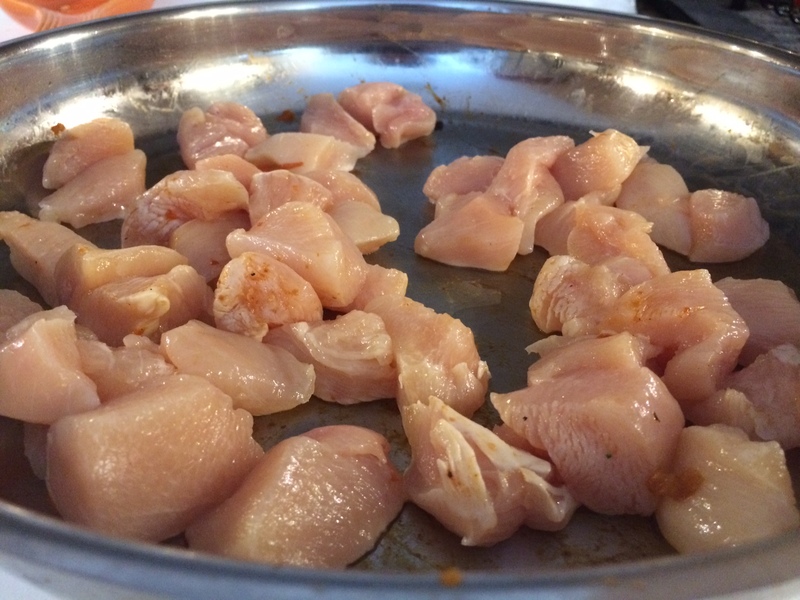 Cook chicken all the way through, adding a little more skillet sauce when chicken is almost finished cooking. 4. When chicken is finished, put veggies back in the skillet with the chicken and add the rest of the skillet sauce (1/2 the bag!). Cook for another 5-10 minutes. 5. Add in pineapples to skillet a minute or two you are ready to plate. 6. Plate and eat with lettuce cups (or tortillas) and your sides (guac, salsa, and maybe some chips!! ).